It is not an easy task for a guy to build an engagement ring from scratch; however, most men take the rough with the smooth. So here is a lowdown to help you build an engagement ring for your fair lady. Half the battle to build an engagement ring is to get one that fits her perfectly. Either you can ask her what her ring size is in a simple, straightforward manner. However, if you want to surprise her then you have to use some devious means. Perhaps you can secretly borrow one of her rings and hope she doesn’t notice. If she does notice, be prepared to spout a white lie like, "Wait 'till I catch the guy who stole your ring!" Or, if the straight and narrow is more your style then ask her parents or siblings for her ring size. With a single, classic solitaire you cannot go wrong. If you wish to be a little different, try a solitaire setting with diamond accents or you can even try a solitaire accented by other colorful gems like rubies or sapphires. If the funky look is your girl’s style then you can opt for a low-cost engagement ring like a permanent tattoo. A simple silver band is also considered in vogue if simplicity is your credo. You can let your budget determine the ring setting. Silver is cost-effective, yellow gold is considered traditional, and white gold shows a quiet understated elegance. If you are still confused, the best thing to do is keep a sharp eye out what she prefers. If you see her sporting steel or silver jewelry then try to choose a white gold setting. Choose yellow gold if she likes to wear that. If you want to save on costs, choose yellow gold in 18, 14, or 9ct. Novori Jewelry will custom make your engagement ring in gold, platinum or palladium. 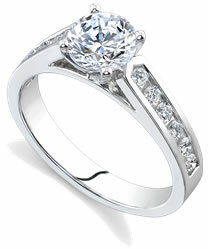 If you want some diamonds to surround the main solitaire diamond then you want a diamond accented setting in the ring. Since these smaller diamonds accent the main one, it is known as a diamond accented setting. The surrounding diamonds can be round or baguettes – the latter just have a flat surface and set flush with the band of the ring. You may be surprised at how little these smaller diamonds cost and how much they add to the look of the ring. Don’t let the technicalities bog you down. Follow your instincts. Who knows your girl better than you? Remeber that she is in love with you and not the ring. The important thing is that you took time and trouble to select and build the engagement ring – and that should be the most important thing for anyone who truly loves you. If and when you do need help, just give us a call, toll free at 1-877-877-4141.